CLICK, a delicious, easy-to-make, all-in-one, coffee protein powder drink mix, is designed to help you achieve your personal weight-loss and health goals. 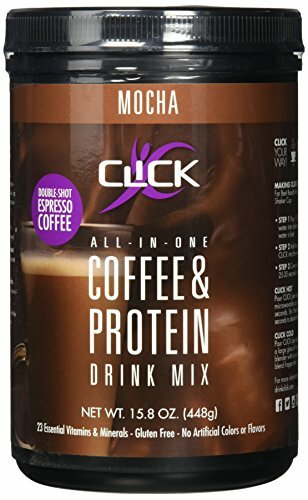 Made with real gourmet espresso coffee and premium grade protein, CLICK provides the decadent flavor you love, with the nutrition you need, to boost your energy, curb your appetite and improve fat burning. Ideal as an all-in-one breakfast meal replacement, appetite-curbing afternoon snack or as a nutrition drink to support your workout. Unlike most protein shakes, CLICK can be enjoyed hot, cold or blended. Enjoy all the CLICK coffee-house flavors knowing you are doing something good for yourself one cup at a time! If you have any questions about this product by CLICK, contact us by completing and submitting the form below. If you are looking for a specif part number, please include it with your message.